Simon Wu, part of Shanghai Community International School's class, is the first-ever student-athlete to sign and participate in an National Collegiate Athletic Association program. 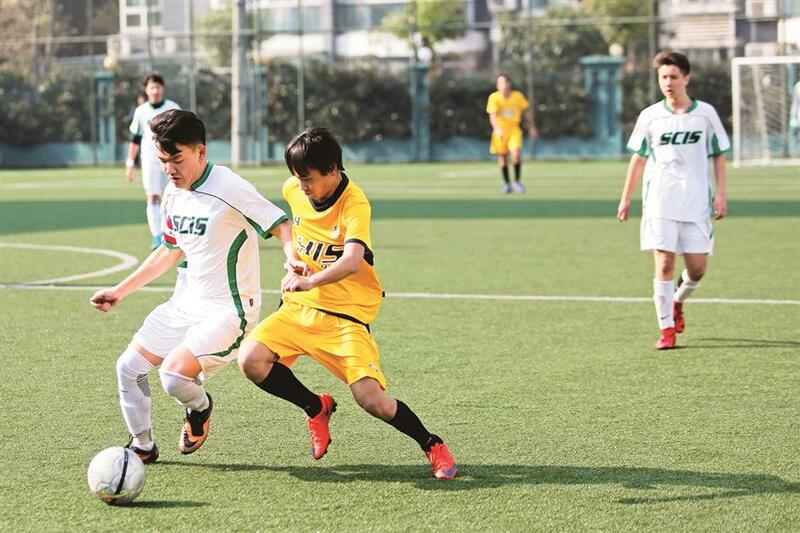 Simon Wu tussles for the ball during SCIS Dragon Cup Competition. Simon Wu, part of Shanghai Community International School’s Pudong class of 2018, is the first-ever active student-athlete at the school to sign and participate in an National Collegiate Athletic Association program. After a tedious and determined two-year-long process, he was offered a spot on the soccer team at North Park University in Chicago, an NCAA Division III college in the United States. We talk with him about his perseverance to follow his passion and his future plan. Q: Congratulations on getting into North Park University. Why did you choose NPU? A: To be honest, when I first received an e-mail back from North Park, I did not know much about them. I had been sending out thousands of e-mails to hundreds of schools across North America and this was one of the ones that replied. It wasn’t until the coach, Vic, mentioned them being a nationally ranked school that I realized how great it was that they took an interest in me. That was the other big factor in my decision as I knew I wanted to play in a strong soccer program to further develop as an athlete. Q: How do you feel about playing at college level next year? Are you excited? A: It’s very exciting! During my sophomore year, there was a period of time where I wanted to give up playing the sport and I remember sitting myself down one day to really think about what it was I wanted to do with my future and whether soccer would play a part in it. That day I decided that it was time to take things to the next level and that playing for a university would be my goal for the next two years. From then on I told myself to keep at it and be the best player I could be. Now my next goal is to perform my best at the college level. Simon Wu (left) poses with Coach Vic, Athletics and Activities coordinator at Shanghai Community International School Pudong. Q: There are thousands of universities with NCAA soccer; what criteria were used when selecting which schools to reach out to? A: At first, we sent out a bunch of e-mails to as many schools as possible, and as we narrowed it down it all came down to location and the academic program. The reason why we chose North Park was because of its community and location, and it offered athletics training as a major, which is what I had intended to study post graduation. Having top-class facilities was another factor and North Park delivered. I think ultimately, the decision was made based on how closely the community resembled that of SCIS and how that would mean a natural transition. Q: What does it mean for you to get signed by a university? A: The biggest part of being signed as a college athlete representing SCIS is being able to put the school on the map. I really wanted to give something back to the community where I’ve been provided with such great opportunities growing up since the fifth grade. There are so many people who have influenced me, past coaches from soccer, volleyball and basketball. It’s different parts of the components of these sports that made me who I am and a big part of it is SCIS and the commitment to the sports. Q: Has it been your dream to become a professional soccer player? A: Ever since I can remember I’ve been wanting to play soccer professionally. It’s always a dream as a child, and now it all depends on how well I grow as an athlete and develop at university level. My focus is still on athletic training, education and learning as much as I can in that area. I personally hate being injured and on the sidelines, so my goal is to be able to help athletes get back on the field and get back to their best. Q: What do you know now that you wish you would have known at the beginning? A: I would say start the recruiting process in the US because ultimately it’s easier as you get more exposure to clubs and universities. At the same time, I can’t imagine leaving Shanghai, as it’s where I grew up and my home. 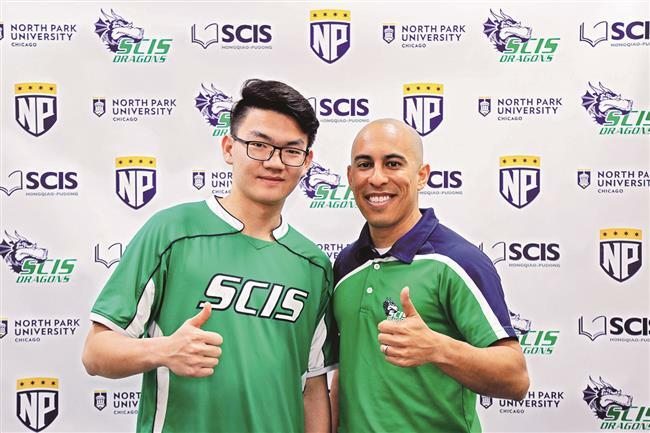 I take great pride of being one of the few international students coming from Asia to play at North Park, and I’m even more proud to be able to represent SCIS all the way. Q: What advice would you give to someone interested in pursuing NCAA athletic opportunities? A: Be committed to what you want to do, never have somebody say no to you and prove the doubters wrong. If you want something, you have to persevere and push through the ups and downs.